Mr. Clean Magic Erasers – How Do They Stack Up Against Other Sponges? Mr. Clean Magic Erasers, and other types of “magic erase” cleaning tools, have been billed as an easy and foolproof way to help scrub many different household surfaces, from baseboards to bathrooms, from crayon-covered walls to burnt-up kitchen countertops. But do these “magic” cleaning tools really live up to their name? How do they stack up, compared to traditional sponges? How Do “Magic Erasers” Work? Magic Erasers, manufactured by Mr. Clean (and also available in other generic versions), are typically made of a product called melamine foam. Once you activate melamine foam with water, tiny filaments in the foam open up, transforming the surface of the sponge into the perfect way to dig into grime, soap scum, stains, crayon and marker marks, and other irritating household messes. For more insight on how melamine foam works as a cleaner, you may want to check out this handy primer from How Stuff Works. In general, Magic Erasers really do live up to their promise of helping your most stubborn household messes magically disappear. Just add a bit of water to the sponge, wring out the excess, and start scrubbing – in just a few glides, you’re likely to see that annoying stain disappear. They don’t require cleaning products. With a Magic Eraser, all you need to get a deep clean is water. 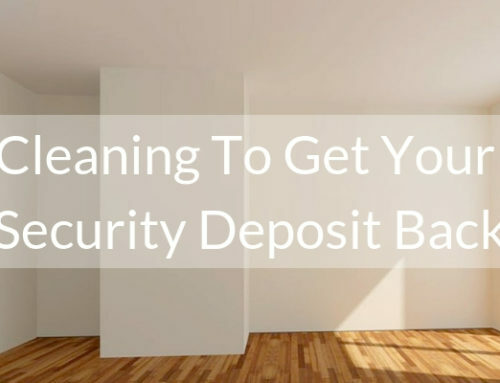 This means you won’t need to waste money or storage space on expensive household cleaners. They work on many different surfaces. Magic Eraser pads can be used on many different surfaces, places where you may not normally think of using a sponge. Walls, bathroom surfaces, baseboards, refrigerator, sink, kitchen fixtures – the Magic Eraser can help you clean them all. They work on many different types of messes. Crayon or marker marks on the wall? Sticker residue on your favorite kitchen surface? Grass stains on your plastic welcome mat? Nail polish or paint scattered around? The Magic Eraser can help get rid of all of these annoying types of grime, and many more. You won’t need to struggle and strain. 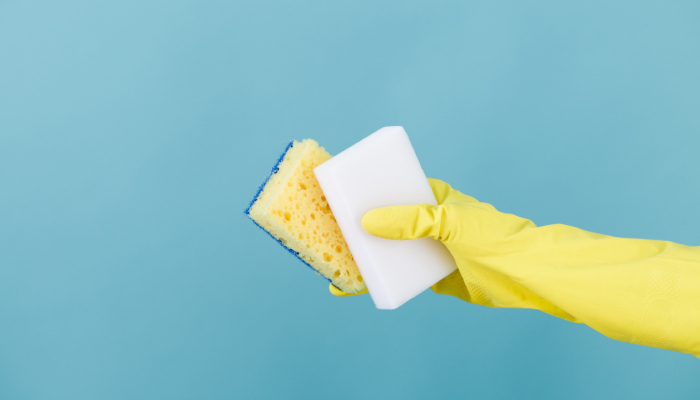 Because the Magic Eraser is such a powerful cleaning tool, you may be able to get rid of tough and set-in stains with a lot less “elbow grease” than you may need with other, more traditional sponges. Plus, you’ll be able to save time, not having to go over the same spot over and over again. They’re reusable. You can generally get several uses out of one Magic Eraser. This makes them a big step up over other types of “disposable” cleaning products, like sanitizing wipes or paper towels. They aren’t for every kind of surface. Magic Erasers are so powerful that you can’t use them on sensitive, delicate household surfaces. Finished wood surfaces, glossy walls, fabrics, and some other surfaces may be stripped by the abrasive surface of the Magic Eraser. Before taking on a full job, be sure to test out the tool on a small, out-of-the-way part of the surface, to make sure it doesn’t cause any damage. You can’t forget about safety. Because it is so tough, the Magic Eraser could cause some light irritation on your hands or other exposed skin, so you may wish to use gloves when you put it to work. As with so many other cleaning products, take care around kids and pets, for whom the Magic Eraser may be a choking hazard. Magic Erasers do disintegrate. While they’re intended to be used multiple times, Magic Erasers do disintegrate and show signs of wear and tear – sometimes even after just one use. Your tool may start to fall apart, so it may prove helpful to have a backup ready to go. So, what’s the verdict? Generally speaking, we love the Magic Eraser here at Sweeping Dimensions. It’s a powerful and effective cleaning tool, which can help you conserve cleaning product, save your energy, and get tough jobs done faster. While they’re not for every job, or for everyone, many people will find their cleaning routines improved by the addition of a Magic Eraser or two. Or just check out some of the glowing reviews on Influenster and Amazon to see what other everyday people have to say. We’d love to hear from you! What do you think of the Magic Eraser? Have you found any secret uses for them that you think our team should know? Do you have any other favorite cleaning products that you think we should review or try out? Let us know over on Facebook! 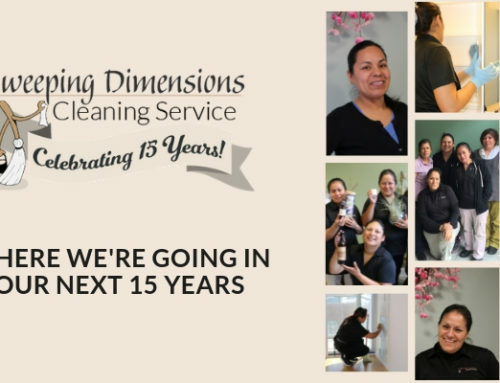 And remember, for all of your Chicagoland cleaning needs, Sweeping Dimensions is here. 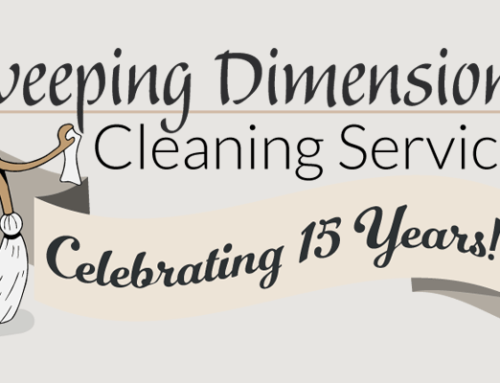 Curious about our cleaning philosophy? Ready to see how we can make your life less stressful? Be sure to check out our FAQ, or get in touch right now for your free service estimate!